Nashville is changing. It’s changing A LOT. And so is our little town of Franklin, one of Nashville’s major suburbs. Since 1980, Franklin’s population has increased more than 500%, which you’ll have no trouble believing if you want to go anywhere during morning rush hour – or lunch hour – or evening rush hour – or a Saturday – you get the gist. Whereas we used to be the “#1 small town in Tennessee,” we are now ranked as the 7th largest city in the state! While Franklin has maintained its classic southern charm, we’ve also welcomed a healthy number of transplants from all over the USA, and from other countries, as well. With that in mind, I thought it would be fun to talk about classic Southern Fiction writers. These writers have played an important role in capturing, communicating, and preserving some of the cultural aspects of the South, from the hills of Appalachia to the bayous of Louisiana, and the states in between. Whether you’re new to the southern states, or you’re a native southerner who wants to get more familiar with a writer who shares your family culture, I hope you’ll find an interesting, new-to-you author by the end of this post. Mark Twain – The Adventures of Tom Sawyer (1876); Adventures of Huckleberry Finn (1885). “All modern American literature comes from one book by Mark Twain called Huckleberry Finn,” wrote Ernest Hemingway in a 1935 essay. William Faulkner called Twain “the father of American literature,” and Twain’s obituary acknowledged him as “the greatest humorist [America] has produced.” Tom Sawyer and Huckleberry Finn deal with boys growing up and adventuring along the Mississippi River in the antebellum South. Twain was known for his use of satire, and both of these books carry with them heavy doses of social criticism. Living in late 19th century Louisiana, Kate Chopin denied being a feminist or a suffragist. But she viewed the culture around her with a probing eye. With a knack for clear, compassionate observation, and the boldness to write honestly – even if some subjects were deemed controversial, even immoral, at the time – Chopin nonetheless helped pave the way for 20th century feminist authors. The Awakening, about a young woman who determines to discover her identity beyond “wife” and “mother” despite societal conventions, is a staple in English literature classes. She also published several important short stories. Mississippi native William Faulkner created the fictional Yoknapatawpha County, placed it in his home state, and set most of his short stories and novels there. This allowed him to explore a variety of social groups within the same locale. He is known for including passages of “stream of consciousness” writing his stories, where he eschews proper grammar and punctuation in an attempt to convey the state of a character’s mind. Faulkner’s novels can be considered allegories for southern history. He was awarded the Nobel Prize for Literature in 1949. In addition to her works of fiction, Zora Neale Hurston collected African-American folk tales, published anthropological studies on voodoo practices, and wrote plays, non-fiction, and poetry. Their Eyes Were Watching God is her most well-known novel. It explores themes of race, gender roles, and gender inequality. The heroine, Janie Crawford, comes to learn what it means to take ownership of her life, and what it means to be an independent woman in early 20th century Florida. Welty is a much-loved, much-awarded author who lived most of her life in Mississippi. Also a documentary photographer during the Depression era, she often found inspiration in the subjects of her own photographs. A woman ironing clothes behind a post office became the subject of one of her finest short stories, “Why I Live at the P.O.” Some southern authors have a reputation for world-weary cynicism. Welty instead managed to address difficult subjects – race relations, poverty, aging, loss – with a tender, artistic, even optimistic, voice. Robert Penn Warren – All the King’s Men (1946). Warren was born just over the Tennessee line in Guthrie, Kentucky. Another staple of English literature classes, All the King’s Men won him the Pulitzer Prize in 1947, and its 1949 film adaptation won an Oscar for Best Picture. For this dramatic story of a once-idealistic lawyer’s descent into brutality and corruption, Warren likely took inspiration from the real life of Huey Long, former governor of Louisiana and a US Senator, who was assassinated in 1935. The novel, known for its “dramatic tension[,]… fierce emotion, narrative pace[,] and poetic imagery,” offers important insight into one facet of southern politics in the 1930s. I can’t say anything about To Kill a Mockingbird that hasn’t already been said. If you haven’t read it, make it first on your list. To find even more southern authors worth your time, check out the members of the Fellowship of Southern Writers (https://en.wikipedia.org/wiki/Fellowship_of_Southern_Writers). Their charter members include several authors from this post. You will find modern, influential southern writers among them as well, including Wendell Berry, Kaye Gibbons, and Tony Earley, well worth exploring in addition to the classics listed above. Enjoy! When it comes to monsters, what frightens me most is a sense of inevitability. A monster doesn’t have to be hideous or enormous to cause you to lose control: think the fatal allure of Dracula, or the overwhelming numbers of a zombie invasion. And what about a creature that can cause you to descend into madness, living — perhaps eternally — after having lost the essence of who you are? “The Hound of the Baskervilles,” by Adam Burke. Sherlockian scholars consider this Sir Arthur Conan Doyle‘s perfect novel. The tale has been adapted, riffed on, referenced, and parodied dozens of times, taking new forms in every kind of media, including comic books, plays, radio dramas, video games, and more. How has this story stood the test of time? Sherlock Holmes is, of course, one of literature’s most fascinating characters. But the spectral hound is the real draw. Tied to local legend and a family curse spanning generations, it is an unearthly beast that glows in the dark, pursuing members of the Baskerville family across the moors until they drop dead from fright. But the hound leaves the dead bodies alone. Therefore, the beast doesn’t hunt for food, making its motives inscrutable, but undeniably evil. Life on the moor is full of secrets and intrigue, both stimulating Sherlock Holmes’ mind and hampering his investigation. Holmes, a man of science, remains skeptical about the supernatural hound’s existence, but he can deny neither the enormous paw prints left in the sodden ground, nor the chilling howls heard in the night. Doyle perfectly paces this novel, increasing the suspense until the climactic moment: the terrifying appearance of the hound! Book cover for Pan Books edition of The Birds and Other Stories, artist uncredited. You’re probably aware of Alfred Hitchcock’s classic film The Birds, but did you know he based it on a short story by Daphne du Maurier? While not a “monster story,” this is one of my favorite works of suspense. For me, the premise is all the more terrifying for being within the realm of possibility, especially as we see a growing occurrence of natural disasters in real life. In remote, rugged Cornwall, a wounded war veteran named Nat becomes increasingly aware of flocks of restless birds. The flocks increase in number, and the birds grow more violent and daring. At first, Nat attributes this behavior to the unusual weather, but takes the threat more seriously than do his neighbors. Soon, however, the entire country is under siege, and it’s no longer safe to go outdoors. The tension mounts beautifully, as the narrator gradually comes to understand the enormity of the event: the birds are inescapable, and this isn’t a fight he can fight alone. What I love most about this short story, as opposed to the film version, is how it activates my imagination. (The same could be said for every good book, I suppose.) Visualizing the growing threat, the brutal attacks, and the despair of the survivors leaves me breathless and full of adrenaline. Promo photo for Bird Box, from Harper Collins Canada. For a more modern look at the toll horror takes on a human mind, we turn to Bird Box, Josh Malerman‘s debut novel. No one can say what the creatures in this story look like, because anyone who glimpses them is driven to immediate, deadly violence, culminating in suicide. The victims lose their minds, as well as their humanity, before losing their own lives. A mother and her young children have survived by covering the windows in their isolated house, and learning to navigate blindfolded when they go outside. Now, they are driven to leave their home behind, and they set out on a blindfolded quest to find other survivors. Who can they trust? And what is following them? Be warned: this intense novel doesn’t shy away from the disturbing, graphic descriptions of the victims’ deaths. Tim Curry as Pennywise in ABC’s 1990 miniseries, IT. Owned by Warner Bros.; photographer unknown. When you think “scary clown,” you probably picture Pennywise, the creature Tim Curry played in the 1990 TV adaptation of Stephen King‘s novel, It. The thought of a creepy guy in white makeup who wants to eat children is sufficiently scary for most people, but IT is more than that: the clown is only one of the forms IT takes. Ancient, malevolent, and powerful, IT comes from an unknown dimension. It lies slumbering until atrocious acts of human violence awaken it (unfortunately, this happens fairly regularly). When it comes to earth to feed, IT can take the shape of anything it chooses, in order to lure its victims. Sometimes IT appears as a victim’s loved one; other times, IT appears as a victim’s worst fear. 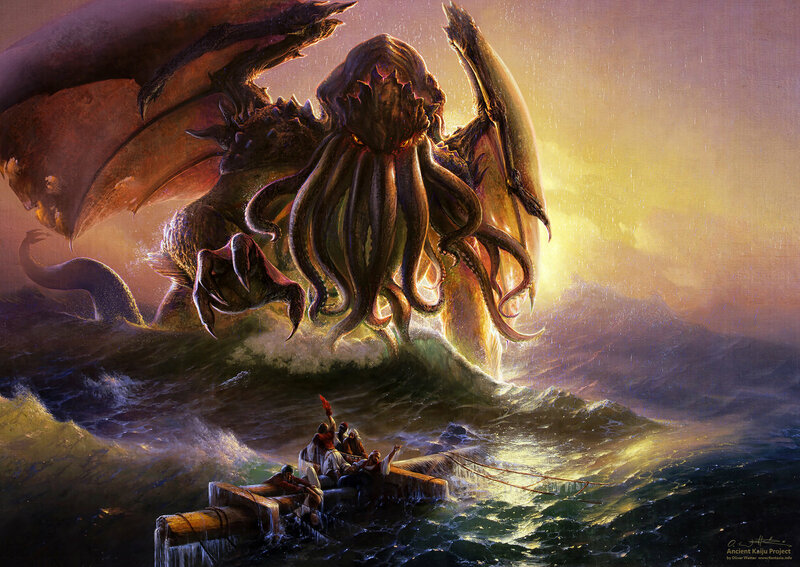 But, as with Cthulhu, if a person were to see IT’s true form, the absolute horror would so baffle his mind, that he would go insane. Did your favorite creature make my list? Leave a comment below! And if you’re looking for history on some of the most famous undead creatures, check out this blog post from last year, “How Monsters Are Born,” by reference librarian Sharon Reily.